Steve Middleton is a private pilot and podcast host who lives in Unsworth and according to Sky News has an opinion on most things. Yes, that is an actual quote from a Sky News researcher who phoned me up to ask me to appear on Sky News (as I had already appeared twice before with Colin Brazier). For almost a decade, Steve was a Liberal Democrat campaigner. He stood as a candidate on behalf of the Liberal Democrats in the Salford 2009-2013 local elections and was agent for the Salford & Eccles Liberal Democrat candidate in the 2010 general election, where he led from the front and successfully halved Hazel Blears majority. Steve was Secretary of Bury Liberal Democrats 2013 – 2018. 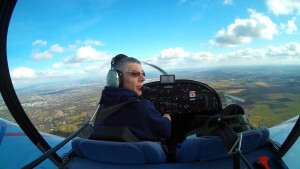 Now politically homeless, Steve spends his free time flying the Eurostar EV-97 and Ikarus C42 fixed-wing microlights. This website remains as a record of Steve’s previous campaigns and now as a repository for his flying videos and podcasts.